Cincy Event Planning | Cincinnati + Dayton Wedding and Event Planners: Happy New Year! A big thanks to our clients for making 2008 the most successful year for CEP to date! 2009 should be another exciting year for us. In the works for our blog this year... a weekly blog post (hopefully more frequently) featuring the following: upcoming weddings, couple profiles, favorite vendor profiles, inspiration boards, planning advice and of course photos / videos of all of our events. 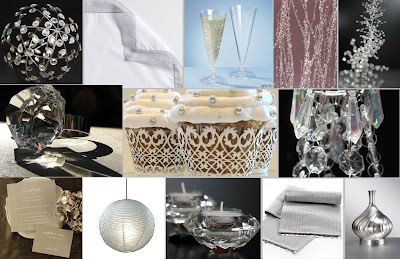 I thought I'd share the inspiration board for an upcoming engagement party I'm planning for my little brother & his fiancee Sarah. Ok, so he's nearly 30, and much bigger than me, but he'll always be "little" brother to me! They are driving cross-country from California to Cincy right now... can't wait to see them both! Oooh, it looks lovely! Frosty and elegant!